The Alabama coaching staff has selected its Players of the Week for the week of the Western Carolina game. Offense: Anthony Steen, Chance Warmack and Michael Williams. The guard duo of Steen and Warmack helped the Tide’s Eddie Lacy and T.J. Yeldon rush for 154 yards in limited action. The starters accumulated 338 yards and 42 points in their 30 minutes of play. Williams caught one pass for 22 yards. Defense: C.J. Mosley and Nico Johnson. Mosley led the team in tackles (again) with six, one for a loss. Johnson also notched a tackle for a loss on his way to a four-tackle performance. Special Teams: Landon Collins and Brent Calloway. Collins, a true freshman, contributed two tackles in kickoff coverage, as did Calloway. Both of Calloway’s stops in kickoff coverage were inside the 20. Collins had one tackle inside the 20 while also downing a punt inside the 10-yard line and forcing a fair catch on another punt. The Alabama coaching staff has named its Players of the Week for the week of the Mississippi State game. Offense: Chance Warmack, Michael Williams and T.J. Yeldon. Warmack, also named SEC Offensive Lineman of the Week, had four pancake blocks to go along with no penalties in the win. Williams caught five passes for 38 yards, one of which was a nine-yard touchdown reception. 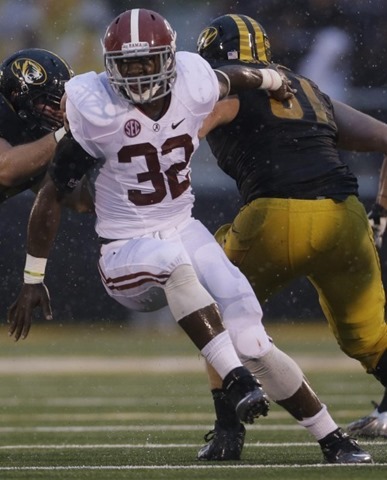 Yeldon took the team lead for rushing yards after his 10-carry, 84 yard performance gave him 649 on the season. Defense: C.J. Mosley and Denzel Devall. Mosley makes his way back to the Players of the Week list, now only missing one week. Mosley was credited with seven tackles, four of them solo efforts, and a quarterback hurry. Devall, a true freshman, imposed his will on the Bulldog pocket with two tackles for a loss, one sack and two quarterback hurries. Special Teams: John Fulton, Christion Jones, Cyrus Jones and Cody Mandell. Fulton notched two special teams tackles in the game and downed one of Mandell’s punts at the 2-yard-line. Christion Jones forced two fumbles in special teams units to go along with his one reception for 22 yards. 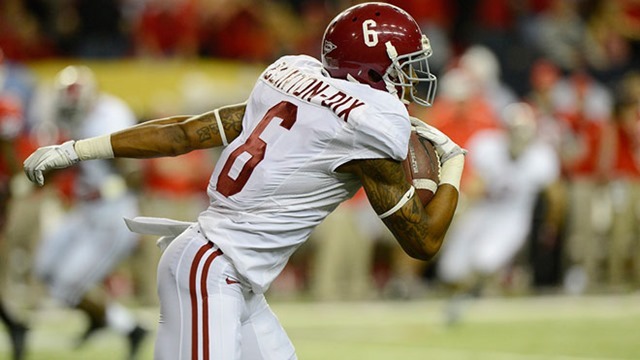 Cyrus Jones had two kick returns for 76 yards, including the game-opening 41-yard return. Mandell punted five times for an average of 42.2 yards.three landing inside the 20, with a long of 61. The staff of SportsIllustrated.com has put out its midseason All-American team, a team that is laden with Alabama talent. The 1st-team is as follows. RB: Johnathan Franklin, UCLA, and Stefphon Jefferson, Nevada. WR: Stedman Bailey, West Virginia, and Terrance Williams, Baylor. T: Taylor Lewan, Michigan, and Luke Joeckel, Texas A&M. G: Jonathan Cooper, North Carolina, and Chance Warmack, Alabama. DL: Jadeveon Clowney, South Carolina; Will Sutton, Arizona State; and Damontre Moote, Texas A&M. LB: Jarvis Jones, Georgia; C.J. Mosley, Alabama; Manti Te’o, Notre Dame; Chase Thomas, Stanford. CB: Jordan Poyer, Oregon State and Dee Milliner, Alabama. S: Matt Elam, Florida and Eric Reid, LSU. P: Quinn Sharp, Oklahoma State. All-Puropse: Dri Archer, Kent State. Alabama’s D.J. Fluker was on the second-team, along with the following SEC players: T.J. Johnson, Jake Matthews Jr., Kevin Minter, Johnthan Banks and Ace Sanders. SI.com also put together its Midseason Crystal Ball Watch. 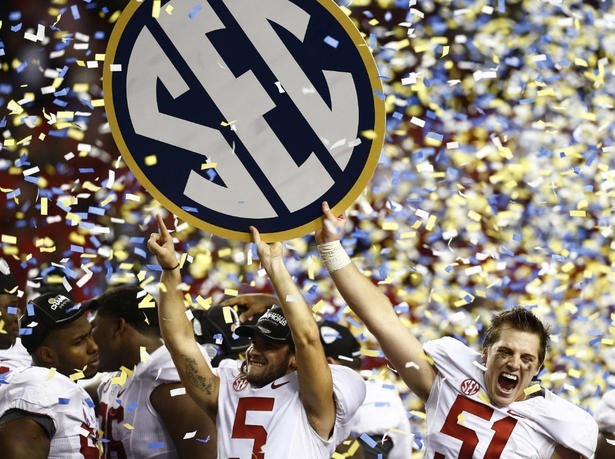 It polled its six college football experts (Andy Staples, Stewart Mandel, Holly Anderson, Lars Anderson, Ben Glicksman and Mallory Rubin), and all of them have Alabama and Oregon meeting in the national championship game. All but Holly Anderson have Alabama winning that matchup. Holly Anderson also predicted that Alabama will lose a game in between now and bowl season and still find a way into the BCS National Championship game. Lars Anderson, on the other hand, predicted that the Tide would win all of its games by 14 or more points. You can view everything the panel had to say by clicking here. The Alabama coaching staff has selected its Players of the Week for the week of the Missouri game, and they are as follows. Offense: Barrett Jones, Eddie Lacy and T.J. Yeldon. Jones helped the offense grade at 92 percent with the coaching staff while committing no penalties and having no bad snaps. Jones also led the offensive line to allow no sacks and no hurries. Lacy carried the ball 18 times for a career-high 177 yards against the Tigers for three touchdowns, one of them on a 73-yard run. Yeldon also had a career-high with 144 yards on 18 carries and two scores, one of them completed with an acrobatic leap into the endzone. Defense: C.J. Mosley and Dee Milliner. Mosley continued his streak, being named a Player of the Week every week of the season, after notching 12 tackles, including one sack, to go along with a fumble recovery and a quarterback hurry. Mosley was also named the SEC Defensive Player of the Week. Milliner tallied four tackles, one for a loss, in addition to a forced fumble and a pass break-up. Special Teams: Landon Collins, Brent Calloway and Jeremy Shelley. Collins, a true freshman, blocked a punt in the first quarter that set Alabama up for a touchdown. Calloway had two tackles on special teams units, one of them inside the 20. Shelley has yet to miss a kick this season after a 6-for-6 performance on extra points in Columbia.